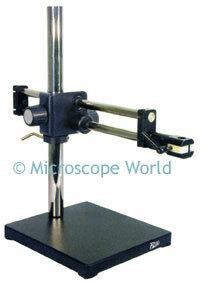 Microscope boom stands allow the user to place large objects under the microscope. The stands provide ease of use, as they swing the microscope body toward and away from the items that need to be magnified. The ball bearing boom stand slides smoothly along the horizontal axis. This horizontal axis can be secured on the vertical post in a number of varying heights. Above is an example of an electronics inspection microscope system on a boom stand. 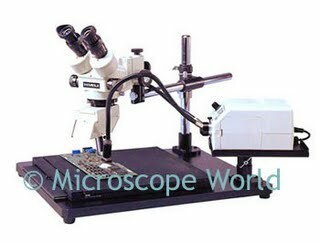 This microscope system uses a 150w halogen dual arm fiber optic illuminator that provides pinpointed light for viewing printed circuit boards. 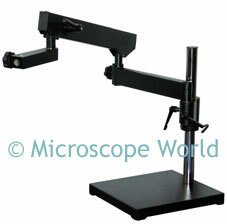 The articulated arm microscope stand has several joints that allow the microscope body to be placed in varying positions. This boom stand secures the microscope body in position until it is adjusted. It does not slide on ball bearings the same way that the ball bearing boom stand does.